A Korean girl poses for a camera while Korean people are getting onto the electric street car in front of Boshingak Pavillion in Jongro in downtown Seoul in 1899. Great Korean Empire (大韓帝國: 1897-1910) was one of the Asia's most advance countries unlike the popular image of Korea as the Hermit Kingdom due to a series of drastic reform policies known as Gwangmu Reform by ill-fated Emperor Kojong (高宗). The Great Korean Empire was the brief empire declared and ruled by Kojong before the nation was annexed by imperial Japan in 1910. Kojing declared Korea as the sovereign empire free of intervention from eight China or Japan. During the short reform period the Korean empire was outpaced China and nearly catching up with Japan in terms of modernization particularly in introducing electricity, street car, and railroads. As of 1901 Seoul was more modern than most of the Asian capitals including Bejing and even Tokyo. Seoul was well equipped with teletype, telephone, electric street cars, and electricity. First opened as early as in May of 1899 a European-style street cars were running in the main street of Seoul from downtown Seoul to Cheongryangri every 10 minutes. 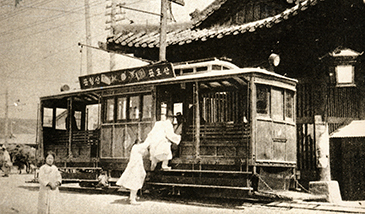 Operation of street cars in Seoul was two years earlier than Tokyo, five years earlier than Hong Kong, and nine years earlier than Shanghai. Streets care started running in Beijing only 25 years later. The reform-minded emperor put his imperial coffer into establishing Hanseong Electricity Company with the aid of American companies. 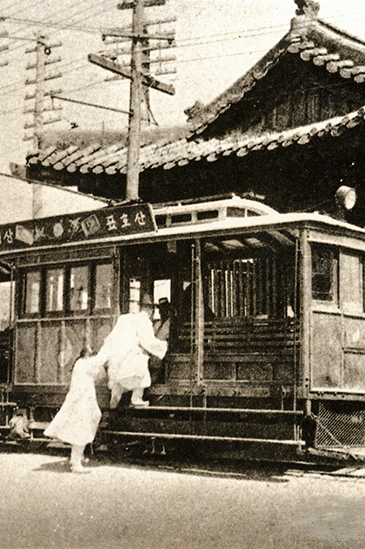 The Seoul street cars were operated by the Hanseong Electricity Company. A total of nine cars including one for Emperor Kojong were secured for the opening the street cars on May 17, 1899. The street cars were running on street of 7.5 km between downtown Seoul and Cheongryangri. Royal family, court officials, diplomatic corpse, high-profile civilians were invited to the extravagant opening ceremony. Two other street car routes were opened a couple of years later. So popular nearly 1 percent of residents used the street cars. Thousands of people used it every day. Emperor Kojong ordered Seoul mayor to change the ancient city of Seoul into a modern one, modeled after Washington DC. Soon the dirty and squalid city of Seoul was transformed into a modern and clean city. Emperor Kojong asked Edison Electric Light Company to facilitate electricity to his palace and to Seoul streets. In 1887 the Gyeongbok Palace, long-time palace of Jeoseon Dynast, was lit with electricity, making the city as Asia's first city to introduce electricity. Three years later all the major streets of Seoul was also lit with electricity as electricity poles were set up on the streets. In 1896 a telephone service was introduced between Deoksu Place in Seoul and port city Incheon west Seoul. The opening of the telephone service in Seoul is almost at the same time of Tokyo. In September of 1899 a railroad was laid between Incheon and Noryangjin in Seoul. A year later Hangang Railroad Bridge was completed connecting Noryangjin and norther part of Seoul.